POLITICAL leaders of the North were said to have reached out to President Goodluck Jonathan in a bid to secure assurances that their preferred candidate would be supported to succeed the president in 2019. In a move seen as a follow-up to the pact said to have been reached with the northern leaders’ strategic committee comprising mainly Northern leaders, the Northern elders led by elder statesman, Alhaji Tanko Yakassai, had visited the Presidential Villa, Abuja last week for further talks and to cement the deal. Though the group met with Vice-President Namadi Sambo, sources confirmed that the key message conveyed through the vice-president to Jonathan was the need for assurances that power would revert to the North in 2019. Sources confirmed that Jonathan had given indications that the North would take power in 2019 after his second term in office during the week-long discussions that yielded the pact produced by the strategic committee. But it was learnt that the elders came specifically last week to get words from the Villa that the North-West would be backed for the Presidency in 2019. It was learnt that the Northern elders had wanted to secure the assurances so as to be in the best position to define their messages to strategic elders and leaders of the Northern region. 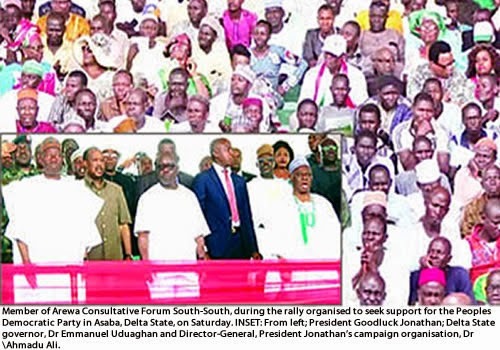 “There has been some rapprochement between President Jonathan and key Northern leaders in recent times. After the release of the strategic pact, which detailed the work the president would focus on in his second term, the leaders have started reaching out in a big way to fashion what would amount to a working arrangement between the North and the South. “One of the objectives is to douse the tension between the zones and reduce the intensity of hate messages and hate campaign in the polity. We believe that once this is achieved at this election, the unity of the country can be assured,” a source close to the strategic meetings said. The source said that the Northern intelligentsia is becoming wary by the day of the activities and desperation of some southern elements around General Muhammadu Buhari, adding that the North was already rethinking the Buhari option. The deal right now is to see how the North would reciprocate years of South-South backing with a support for Jonathan, while the president will, in turn, back a northern candidate to succeed him in 2019. With that pact sealed, we have a concrete message for the North,” a source in the know said. It was learnt that the team reiterated their message during the meeting with Sambo at the Villa last week and was told to expect words from the president directly through its chairman. “I can tell you that the president was immediately briefed on his return to Abuja and words have been communicated to Alhaji Yakassai on the way forward,” the source further said.